Date palms are thought to possibly be the world’s first plant used by humans for producing food. The fast growing trees are relatively easy to sprout and cultivate, and may grow as much as a foot taller each year. 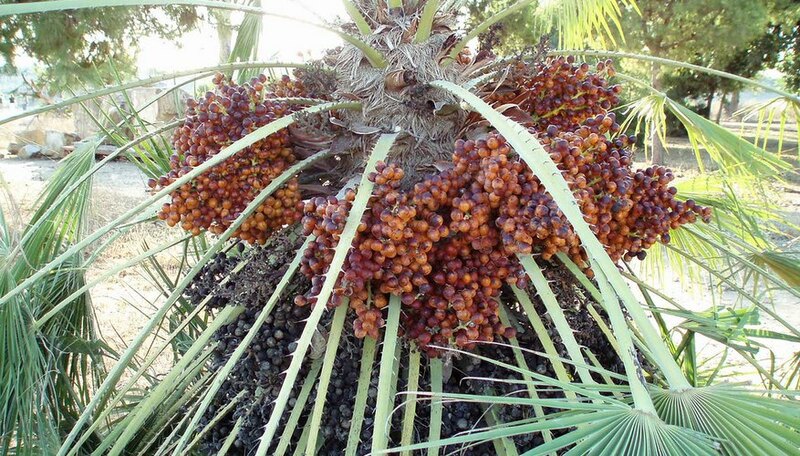 Of all palms, date seeds are the easiest to obtain, and probably the tastiest. Your local grocery store carries whole dried dates, which may or may not have been sugared, either of which is fine for growing. Occasionally fresh dates are available in some supermarket produce departments. Clean as much fruit flesh from the date seed, or stone, as you can with a sharp knife, although most people prefer to use their teeth for this task. Cover the stones with distilled water in a glass jar. Distilled water is best because it contains none of the impurities of tap water, though it isn’t an absolute necessity. Place the jar out of direct sunlight, but in a warm location to provide the seed with a source of bottom heat. Remember that warmer is better, and that these trees thrive best in 90-degree F heat. The top of your refrigerator or above your water heater are good spots, as long as there is plenty of indirect light in the room. Soak the seeds for 48 hours, and change the water several times each day. Take the stones out of the jar and run warm water over them to rinse any sliminess. Pat the excess water from them, and then set them on a cooling rack to air dry at room temperature for a couple of hours. Remove the tiny hairs from the date seed with sharp scissors or tweezers. Pick away any of the date’s flesh that may remain on the seed; this will discourage rot from forming on the germinating seedling. Add enough vermiculite to a 4-inch clay pot to fill it within 1/4 inch of the top of the rim. Clay pots are best for palms because they “breathe” and drain well. Barely moisten the center of the vermiculite with about 2 tbsp. of distilled water. Although it will still feel rather dry to the touch, don’t add any more water, as doing so will likely invite mold to grow on your developing date tree. Place the pot inside a clear plastic bag or clear airtight plastic container, and seal it shut to create a mini-hothouse. Set it back in its warm spot nursery, and take a look at it every other day. If there is any condensation on the inside of the hothouse or if the planting medium feels bone dry, offer your date tree seed a few drops of distilled water. Germination can occur in as few as 14 days, or may take 2 to 3 months to begin producing tiny roots. It all depends upon how fresh the seeds were to begin with. Fill a 4-inch clay pot up to 1/2 inch from the top of the rim with equal parts coarse sand and potting compost when your date tree seed produces visible roots. Place the sprouting seed in the center of the medium and just cover it with the potting mixture. Give the seed about 1 tsp. of distilled water and set it back in its warm spot. Thereafter, give it about 1/2 tsp. of water daily until 2 leaves have emerged fully from the soil. Move your seedling from its warm spot nursery into a warm room of your home, but continue to avoid direct sunlight when selecting a new location. Continue to water a little each day or two, but only enough to keep the soil barely moist.